Counter Sink Drilling Tools are a kind of conical shaped hole, which is cut into a manufactured object, or the cutter used to cut such a hole. It is commonly used to allow the head of a countersunk bolt or screw, when placed in the hole, to sit flush with or below the surface of the surrounding material. As per the requirements of the consumers, we are involved in providing the optimum quality series of Counter Sink. Furthermore, our offered product is enormously identified for its long life among our clientele. Being the leaders in the industry we offer superior quality Countersink Drills to our valued clients. They are manufactured using high grade raw material that is sourced from known and reliable dealers. These micro fine grade drills are available in various sizes and shapes to meet various drill operations. Contents: 8, 10, 12.5, 16, 20, 25mm. With the valuable assistance of skilled team of professionals, we are engaged in manufacturing an extensive range of high quality HSS Countersink. We are the Manufacturer of all type of HSS cutter . 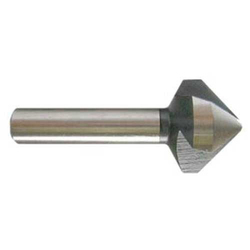 Matching up with the requirements of our clients, we are involved in offering Flute Machine Countersink.